In California, native and endemic plants are slower to shift their ranges in response to climate change, a study shows. In Central California, a narrow, 15-mile wide belt of the Southern Sierra Nevada hosts an ecosystem unlike any other in the world. It’s a climatic niche — vast reserves of groundwater under deep, sandy soil between 4,500 and 6,500 feet in elevation — and it’s home to California’s most famous endemic tree, the giant sequoia, which occurs naturally there and only there. The largest tree in the world by volume, a sequoia known as General Sherman, has been rooted there for more than 2100 years. Giant Sequoias along the General Sherman Tree Trail in Sequoia and Kings Canyon National Park in California. Last summer, after observing unusual amounts of brown foliage on giant sequoias — a sign of stress — researchers set out to assess the trees’ response to California’s historic drought. It’s still an open question how the trees might respond to worsening conditions in the future, but the research brought at least a temporary sigh of relief. 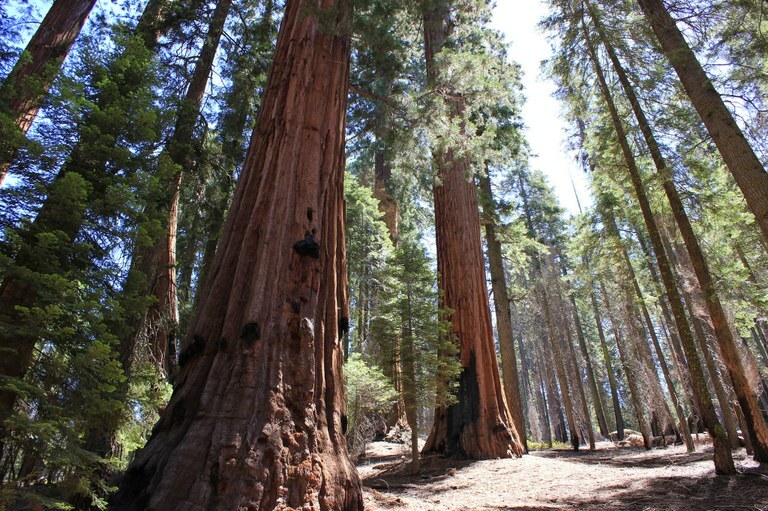 Some giant sequoias were stressed, but not fatally so. But now, a study from the University of California, Los Angeles is raising other questions about the future of the trees and other beloved native plants. The study analyzed more than 680,000 plant specimens collected by California botanists since 1895. The researchers hoped to learn if plants were shifting their ranges in response to the changing climate. The exact location of each specimen was recorded, providing a record of ecosystem shifts for more than 4,000 species in the state over the last century. They found that many native species — like giant sequoias, early onion, and Eastwood manzanita, a large shrub with small, round fruit — are not colonizing higher elevations, chasing cooler temperatures. Meanwhile, non-native and invasive plants are adapting to the warming climate, moving into more favorable habitat. And invasive species are encroaching quickly. Christensen found that non-native plants are far more adaptable than native ones. Weedy plants like the Tasmanian bluegum, purple foxglove and Uruguayan pampas grass, just to name a few, have moved to higher elevations, and entered the territories of local flora, filling their landscapes. On the other hand, the ranges of endemic species like the giant sequoias have largely remained static, which could prove problematic as the conditions in those places change. “The fabric between ecosystems is pulling apart,” Christensen says. “These species could end up in a climate zone that is no longer fit for them,” According to the study, the common factors that tend to constrain the mobility of native and endemic plants are their more complicated reproductive processes and limited options for new turf. It’s pretty tough for a sequoia, for instance, to huck its seeds to higher ground. Part of that has to do with its slow reproductive process. The giant sequoia’s seeds, about the size of a coffee bean, are trapped in cones that fall in close proximity to the mother tree. The seeds depend on the Douglas squirrel or fire to break them free. Once that happens, it takes two years for a sapling to take root. And there’s a second problem: Even if giant sequoias could easily move, they wouldn’t have anywhere to go. While some plants move into cooler zones just upslope of their current habitat, giant sequoias can’t because soil moisture is extremely low on the rocky mountainsides above their niche. Giant sequoias exist in an ecological sweet spot with rich soil and an abundant water supply, says Anthony Ambrose, biologist at the University of California, Berkeley. The researchers didn’t find new invasive species moving into the sequoias habitat — yet. But Elizabeth Brusati, science program manager at the California Invasive Plant Council, says that climate models show that sequoia groves will be suitable habitat for cheatgrass by 2050. If cheatgrass colonized the forest floors of giant sequoia groves, it could compete for water and make the ecosystem more vulnerable to wildfires, she says, and pose an additional challenge to giant sequoias. This story was changed to reflect that Jon Christensen is the senior author of the study. The lead researcher and author is Adam Wolf.